ANSUZ Ansuz is the rune of messages and communication. It can be messages or wisdom received from any source, including deity. Ansuz is centered around listening to messages and seeing true wisdom where it may exist. It can also include blessings. RAIDHO Raidho is the rune of travel, following it’s old meaning of wagon or chariot. But this can indicate both physical travel as well as changes in lifestyle or professional direction. It may also indicate a need to see the larger picture before making a change in direction. 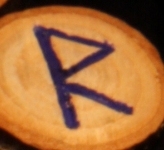 KENAZ Kenaz is a rune whose original meaning is beacon or torch and it tends to be an accelerant. It can indicate the fires of creativity, revelation, new strength or new energy. It may stand for a need to open yourself to those things as well. This entry was posted on Monday, March 17th, 2008 at 1:00 am by Maura Anderson and is filed under Mystical Monday, Runes. You can feed this entry. Both comments and pings are currently closed.